John Wall (19pts, 8a, 7reb) led the Wizards, but didn't get enough help from his friends and the Wizards lost to the Celtics 94-86. The Wizards are now averaging only 83.5 points per game, which is downright awful. They have no chance to win games scoring that low. The Wizards kept the Celtics lead to around 10 points for most of the game, but couldn't break through and take a lead. The Wizards were able to keep that close thanks to John Wall stepping up his game. Unfortunately the Wizards have no 3 point shooters, yet they shoot 16 of them (they made 2). 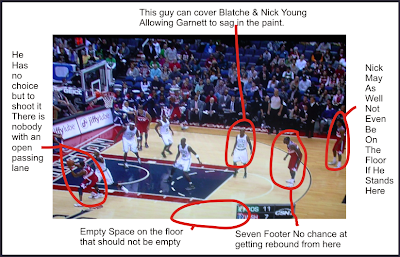 Also unfortunate for the Wizards is the fact that the players around Wall don't help him at all. John Wall gets the defensive rebound inside the paint. In less than a few seconds, Wall is in the paint on the other end of the court. The only problem. The rest of the team is jogging slowly down the floor behind him. If I was John Wall, I would be very discouraged. Wall is a point guard who plays with speed. He pushes the ball up the court. He wants to run an offense. However, whenever he passes the ball, one of his teammates turns the team offense into an individual game. Instead of the ball swinging around and having an offensive flow, Wall's teammates slow the game down, take unneeded dribbles, and shoot terrible shots. When Wall is playing on the court he looks tired. He looks frustrated. He looks discouraged. How could he not?